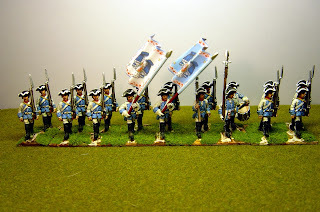 Another Saxon regiment painted as it might have looked in French service. 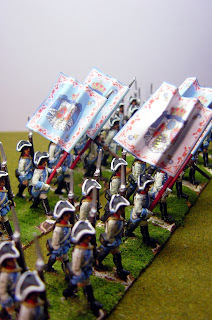 Pre-Pirna this was a single battalion regiment called Grenadierbataillon Kurprinzessin which was brigaded with converged Grenadier battalions. 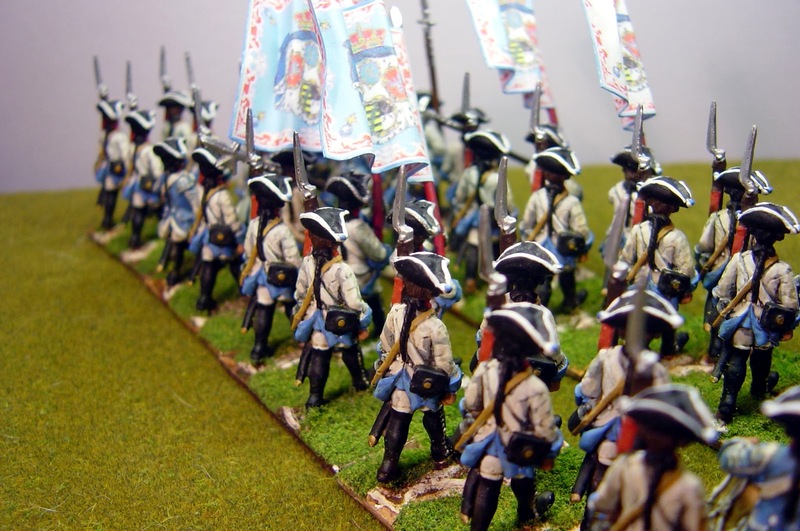 It featured lapels (unusually in this period) and the entire battalion wore Grenadier mitres. 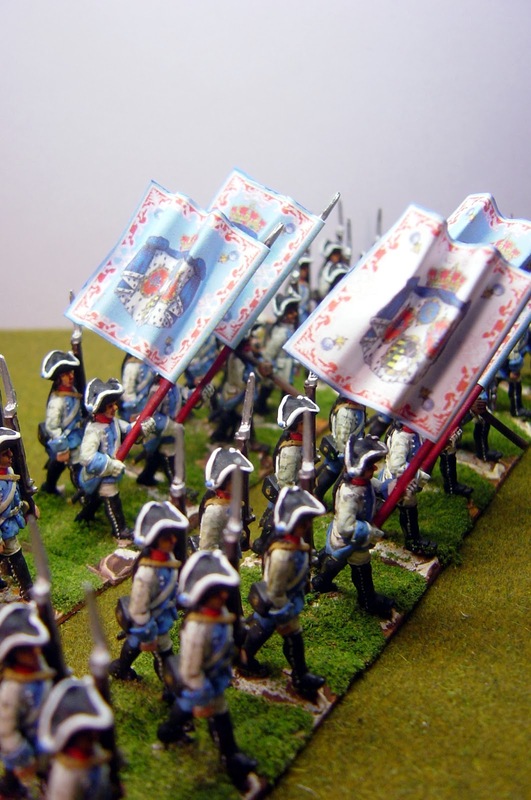 But after the troops had deserted en-masse from Prussian service, they formed a two battalion regiment and dropped the Grenadierbataillon designation. 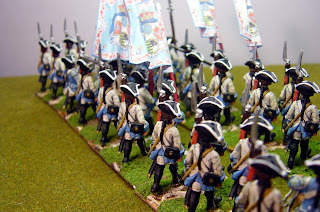 I have still retained red sword knots for the whole battalion on the assumption that elite troops liked to retain their distinctions even after they had been 'reduced in status'. 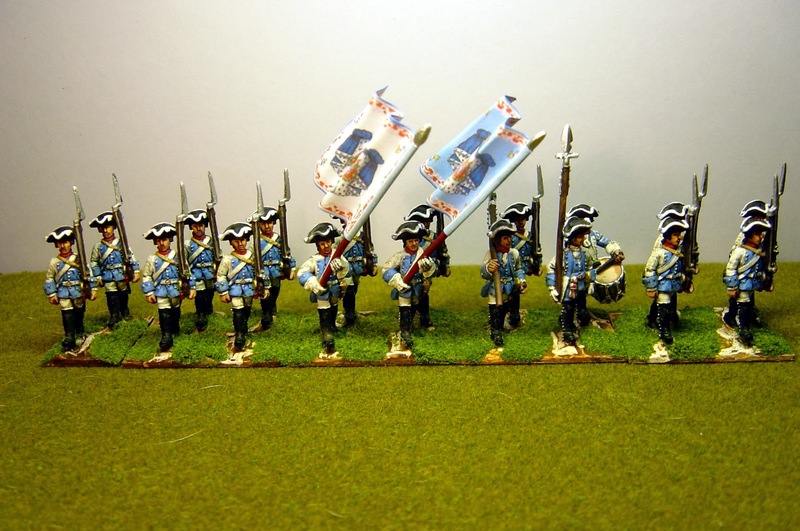 Note that although they lost the designation as a Grenadier regiment, according to Kronoskaf, they retained the right for their regimental band to play the Grenadiermarsch. 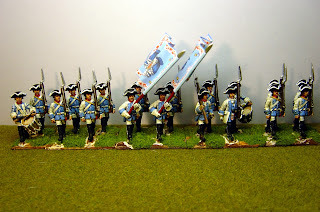 For the actual Grenadier company I have given them moustaches, which is again conjecture on my part. Besides the lapels this regiment's main difference from Xaver (which you have seen in a previous post) is that Xaver had gold coloured buttons, while this had silver. process 'REVERTENTEN' but Christian Rogge told me in an email “Refertenten is a funny outdated German term. Not sure what it means. Possibly English "revertents" "reverters" or in more recent English "returnees".” so I'm not sure. What I do know is that there is a book produced in German by Marcus von Salisch called “Treue Deserteure. Kursächsischen Das Militär und der Siebenjährige Krieg” and I've asked the author if he would do an English precis of his book. If I manage that you will hear of it first here. 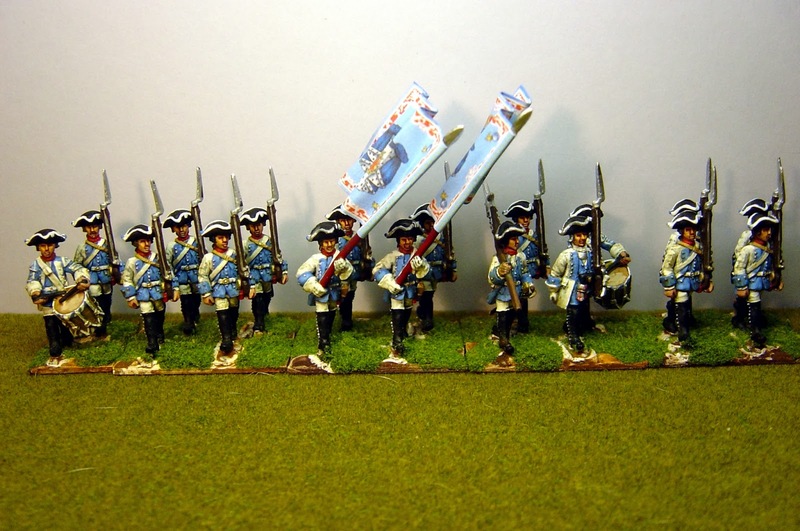 Sometime soon I'll be painting up some rather exotic Saxon Grenadier companies – exotic because many of them wore their old cavalry uniforms! In any case, your figures are gorgeous. Well done! 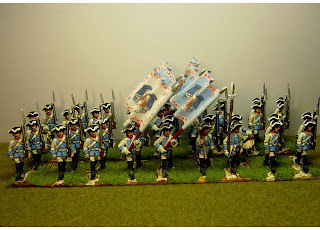 These are gorgeous, nice skin tones and a terrific finish on the white.